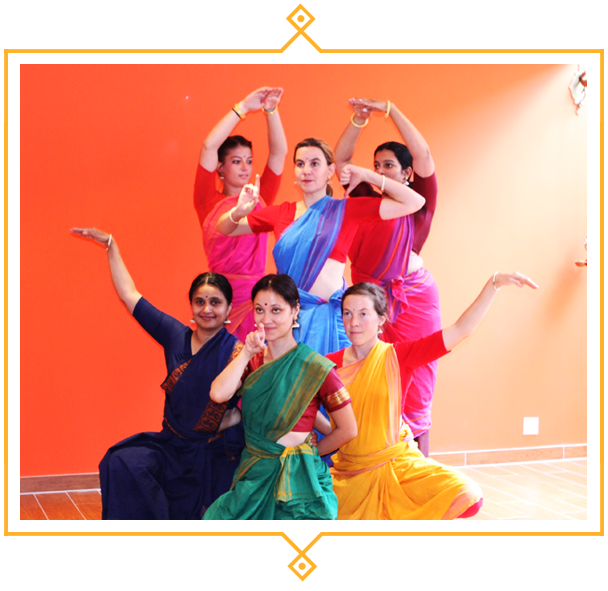 Omkara School of Indian Dance has been a centre for learning Bharata Natyam (South Indian classical dance) and promoting Indian culture since 1987. Home to students of varied nationalities and walks of life, our aim is to foster a deep understanding and passion for the art-form through a better understanding of Indian culture and the philosophy that is its backbone. We strive to guide and encourage students to develop grace, perfection and perseverance while increasing awareness for traditional and cultural Indian arts in and around Geneva. Le Bharata Natyam fût une découverte fortuite qui m’a plu dès les premiers pas de danse. Aujourd’hui encore la danse rythme ma vie, sa musique fait danser mes émotions à travers l’expression, la grâce, l’effort, la concentration. It always feels like the most natural thing to get back into my dance clothes and head to class. This is because Omkara is truly a dance family, we all come from very different backgrounds and are of different ages, yet in class we all are able to relate on a dance level. L’enseignement de Sujatha est très complet, accompagnant les étudiantes selon leurs besoins évoluant de l’enfance à l’âge adulte. Ma fille y trouve des apports nourrissants sa vie spirituelle comme artistique. Happy New Year! Classes resume Wednesday 9 January 2019. See photos from our latest production, JALA – The Dance of Water.